*SHARE THIS EMAIL* *"The only thing politicians need more than votes is ....WATCHING." "Your spiritual power is second to none….. you bow to no one, only God"
"PEOPLE who attend church live longer and are less stressed,"
Psalm 92:12-15: The righteous, planted in the house of the Lord, shall bear fruit in old age and shall be fresh and flourishing. Alabama has a novel solution to protect itself and its officials from having to endorse homosexual "marriages:"
To the surprise of many, President Trump has signed the nation's largest wilderness preservation legislation in a decade. Having a Father, whom you adore, scares the heck outta people …. Chick-fil-A has had the audacity to donate to Christian organizations. They must hire, serve, and promote homosexuals and individuals confused about their gender. People who've resolved not to have children because of, as they put it, the coming "climate breakdown and civilisation collapse." "The Lord is my shepherd I shall not want"..that says it all. "Turn the other cheek" .............. "He who can take a punch …... rules his world!" adopted declarations to hijack control of the global economy and "transform the way we live." She may not expect wisdom from the mouths of babes, but she sure expects Democrat votes from 16 year olds. If you're reeling right now, don't worry, because you're not alone. Witchcraft is thriving in the US, with an estimated 1.5 million Americans now identifying as witches - more than the total number of Presbyterians. "The most important things in life are not what you obtain but what you learn." My Guns.....Mark Robinson "I'm the Majority" "We're gonna keep 'em, Come Hell or High Water!" House Committee voted to retain the phrase "so help you God" in the oath individuals are required to take prior to testifying before the committee. German Chancellor Angela Merkel doubled down on demands for more globalism, both in the form of regional governance and global governance. to Alexandria Ocasio-Cortez "In 2016 alone, some 12,000 millionaires left France - highest in the world"
I am sending this e-mail out to the list of TEA Party e-mail addresses that I have collected over the past couple of years. I sent this out to the King George TEA Party membership yesterday and thought it would be something that I ought to send out to a wider audience. I have noticed that the TEA Party movement needs to be re-energized. I know that my group's attendance at our monthly meetings has fallen off a bit and I suspect the same has happened elsewhere. I think one way to get re-energized is to do more information sharing amongst our groups and I am willing to take the lead on that. If you would like for me to add you to my weekly KGTP Newsletter distro list, please reply to this e-mail. I will add you to our "active" list. In like manner, please feel free to add my e-mail to your distro list as well. Collaboratively I believe that we can continue the efforts we have been working on for the past 10 years. If you have any questions please feel free to drop me a note. I'm going to change things up a bit with this week's Newsletter. As you know, I usually start off with a brief introduction, then outline some important events, and then leave with you with a week's "data dump" of news articles that are relevant to TEA Party interests. This week's Newsletter is a bit different. What will remain the same is that I actively encourage you to share this e-mail as you see fit. "Friedrich Hayek brilliantly argued that the best defense against tyrannical programs is widespread education of what "unfreedom" looks like. Americans can count on the Tea Party to provide exactly that type of education over the next decade. Our tenth anniversary is an opportunity to celebrate our past victories, while, at the same time, rolling up our sleeves and preparing for the battle of ideas that lies ahead between the retrograde socialist policies and the promotion of individual freedom." Most all KGTP members are a bit "long in the tooth" and are thus able to see how our country has changed over the past few decades. Because of our decades of experience we are able to see trends that put us where we are today. For example, I grew up knowing that Communists were whom we were fighting in Vietnam and I grew up knowing that Ronald Reagan's efforts to defeat the USSR – where the second "S" in USSR stood for Socialist – was a worthy and patriotic crusade. Fast-forward to today and we have Bernie Sanders, Alexandria Ocasio-Cortez, and a bevy of others that openly campaign and are currently – CURRENTLY – elected US Government officials. But like all trends, today is but a moment in time along a trajectory of events. So if you see that our country is changing and that we are on some kind of "trajectory" you should stop for a moment to ask yourself a simple question: To where will this trajectory lead? Believe it or not, history and stories of the past can forecast where America is headed – IF WE ALLOW IT TO HAPPEN. The TEA Party was instrumental in defeating Barack Obama's many efforts to impose Socialism (Obamacare is the most notable example) and we were the driving force to defeat Hillary Clinton - a would-be Totalitarian by any measure - in the 2016 election. But if We The People do not continue to successfully defeat their efforts to turn American into the next Socialist state, what will that "look like"? Socialism is but a halfway point on the road to Communism. The best example for what life in a Communist state would be like is China. Would Hayek's description of totalitarian life in China be what "unfreedom" looks like? More important, is it what We The People want for America, and if not… would that knowledge motivate we Americans to vehemently reject any effort to turn America red? 1) Could this happen to America? 2) If it could happen to America, what should We The People do to ensure that it NEVER happens? "In the late 1980s, China was abuzz with excitement and possibility as new ideas, personal freedoms, and economic opportunities were flowing in from the West like a river to wash away the dirt of Mao's Cultural Revolution. During these hopeful times, I was among a group of young student leaders who led calls for political reform to match the new thinking and bring China into the modern world with dignity. We organized rallies and made speeches at schools and squares all across the country, and we fervently believed the top leadership of the Chinese Communist Party would listen. Instead, our movement was crushed by a wave of tanks and the tragic events of June 4th, 1989 in Tiananmen Square that so many of you watched with horror on television. Sadly, a whole new generation of Chinese youth knows nothing about what happened at Tiananmen. While we in the West can freely access the videos and images on the Internet associated with the massacre, all of this content has been ritually 'cleansed' from our Chinese web by a vast army of censors. I have now spent half my life fighting against such censorship and for freedom and democracy in China. More than ever, I fervently believe that this is what every thinking person outside of China must clearly understand: More than two decades after Tiananmen, the totalitarian tiger has still not changed its stripes. In fact, unlike more stable countries, China's spending on police and social control is now rising even faster than China's skyrocketing defense budget. I personally know how true that statement really is. I also know that the cost of freedom isn't always about fighting a military battle. 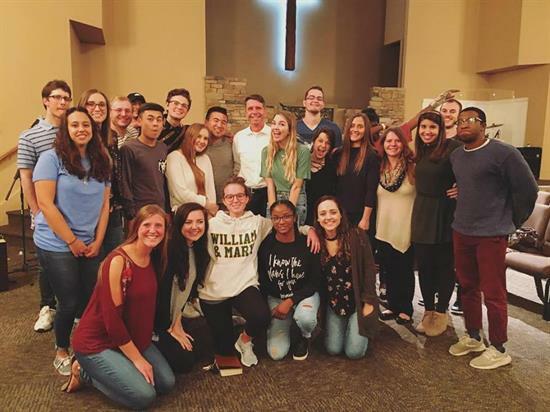 It also includes the individual, political, and economic sacrifices of peacefully defending human rights and standing up for the principals of liberty and democracy." So here is your homework assignment. I have re-printed the two questions posed above with an opportunity for you to supply your answer. You don't turn this assignment into anyone… but you do owe yourself the answers to these two questions. If you would like to provide your answers to me, and would also like for me to share your answers with the KGTP Membership, please feel free to let me know. Q) Could this happen to America? Q) If it could happen to America, what should We The People do to ensure that it NEVER happens? And yes, this will be part of our discussion during our monthly meeting THIS Thursday 7 March. 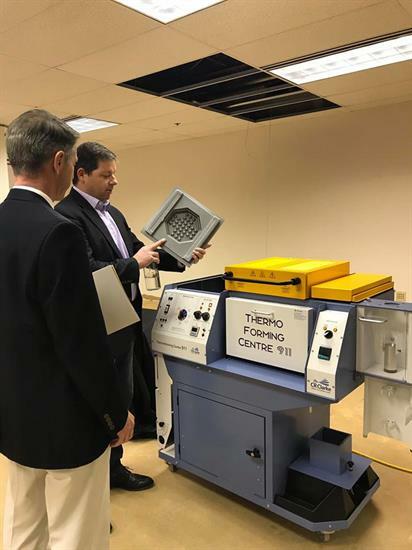 October marked the beginning of Fiscal Year 2019 where, for the first time in a decade, our military started the year with on-time, reliable funding. Restoring years of decaying military readiness so our service members can complete their mission and come home safe has been a top priority of mine. From funding the military, to fighting back against the opioid crisis, to restoring funds for the Chesapeake Bay Program, to bringing our economy back to life, I'm proud of how I have worked to advance critical First District priorities. 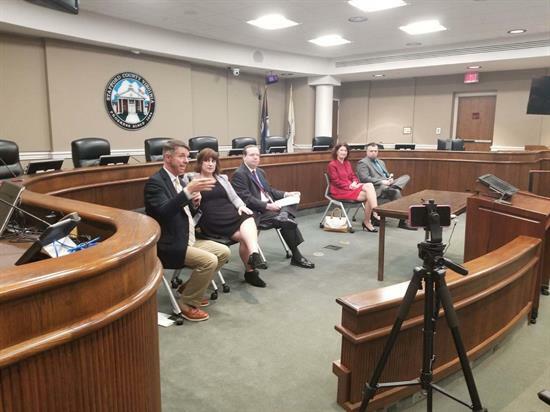 Throughout the district work period this month, I traveled across every county in the district helping constituents with casework issues, visiting businesses, and holding constituent forums to discuss the pressing policy areas facing our nation. Earlier this year, the President signed my bill granting federal recognition to the Virginia Indian tribes into law. 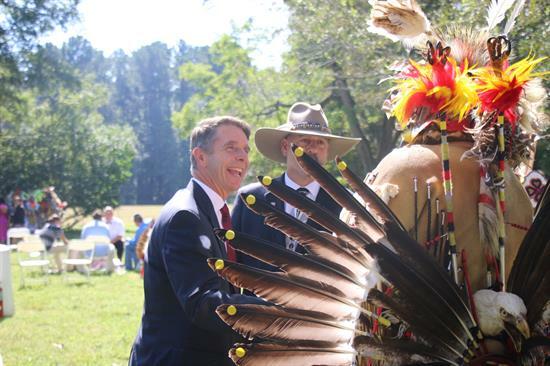 I visited Werowocomoco to celebrate this long overdue recognition for the Chickahominy, Eastern Chickahominy, Monacan, Nansemond, Rappahannock, and Upper Mattaponi tribes. 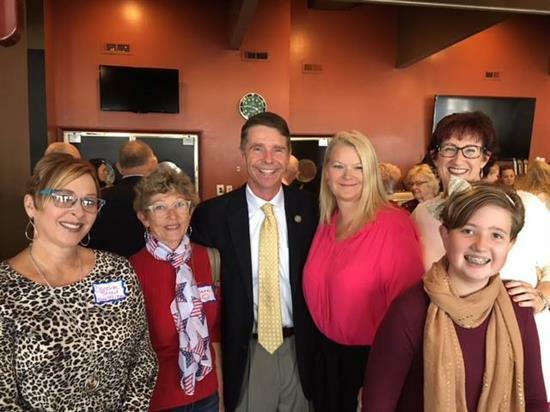 I met with folks in Gloucester and shared an update on my work to rebuild our military, expand broadband access, improve care for our veterans, and connect students with 21st Century jobs. I hosted an opioid forum in Stafford to highlight resources for those suffering and the work being done to end this crisis once and for all. 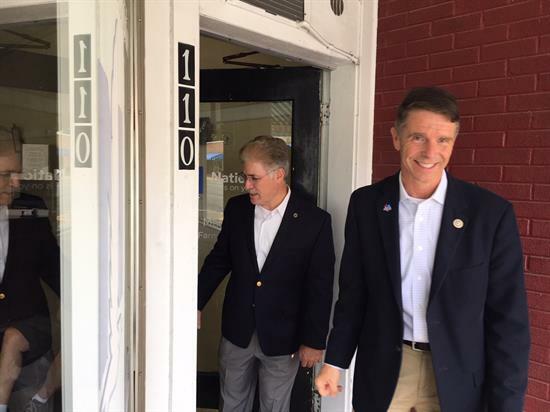 I spent an afternoon touring businesses on Main Street in Bowling Green. One of the most important parts of my job is helping constituents navigate federal agencies. 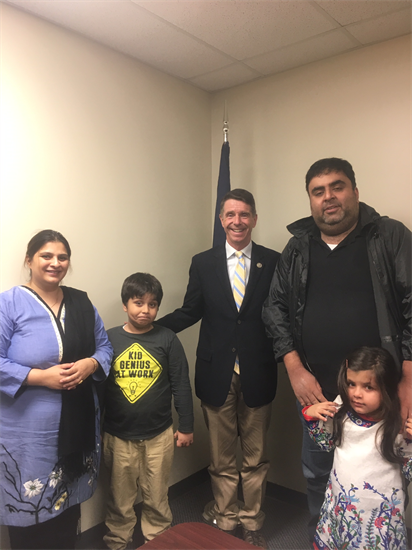 I spent an afternoon meeting with families to hear about their casework success stories. 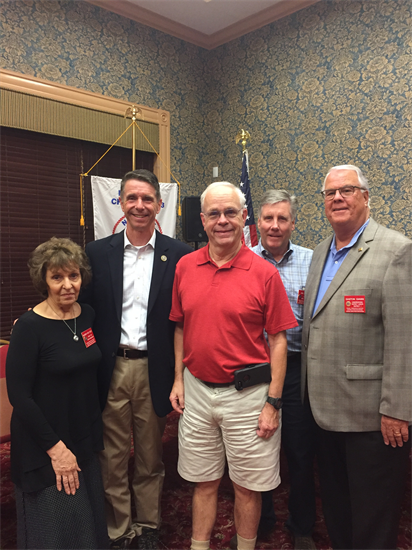 I joined Falls Run NARFE Chapter 2343 to detail how I've advocated for our nation's federal workforce. 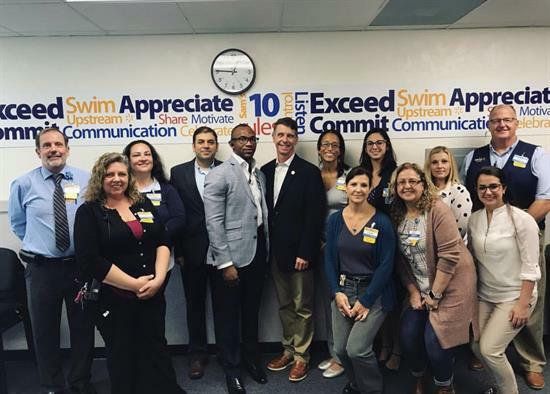 I stopped by Walmart's store and academy in Fredericksburg to chat with employees and see how they are providing opportunities for veterans. 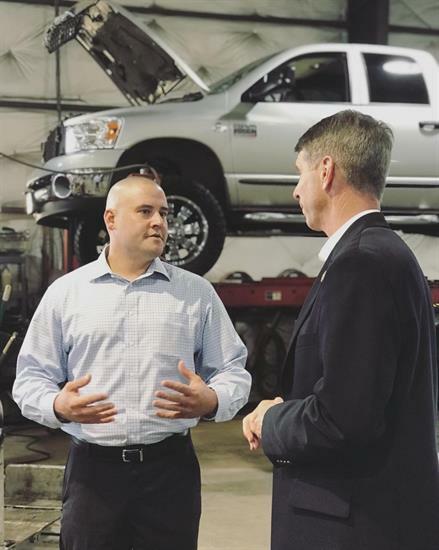 I heard from C&P Offroad Specialists about ways Congress can help sustain current economic growth, keep our businesses competitive, and remove government barriers to success. I talked with my Young Professionals Council about job creation, Career and Technical Education (CTE) and Science, Technology, Engineering, and Math (STEM) education, and ways to sustain our current economic growth. 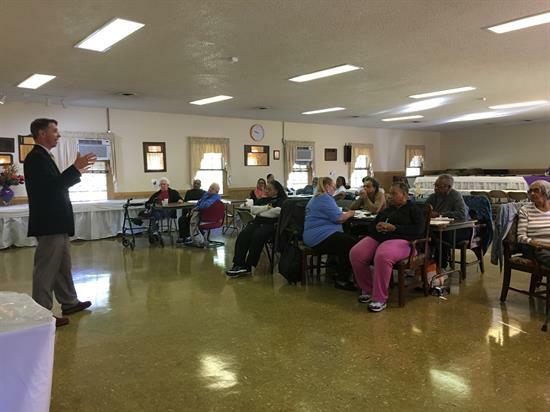 I hosted a seniors' resources forum to discuss recent Medicare improvements and important resources to guard against consumer scams. 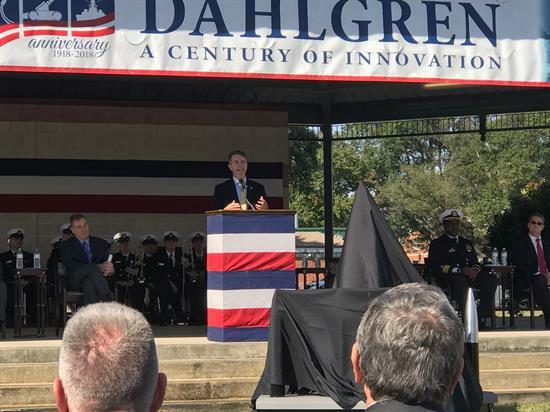 I spoke at the 100th Anniversary of Naval Surface Warfare Center Dahlgren. 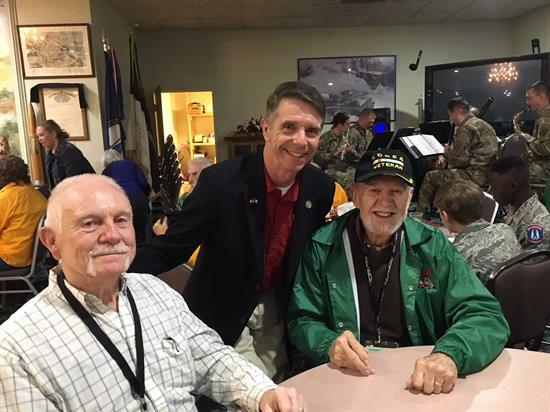 Everytime I attend an honor flight send off, I'm reminded of how much our nation's veterans have sacrificed for us. 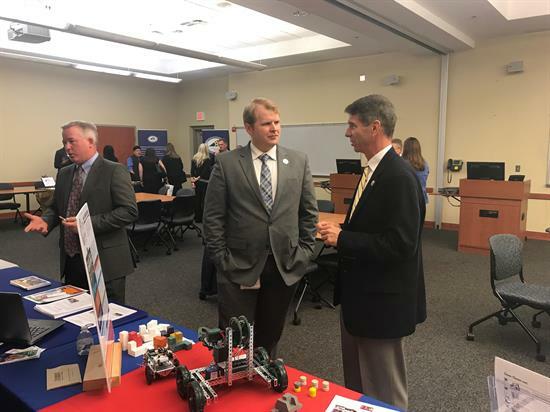 I hosted two Career & Technical Education symposiums, one in Hanover and the other in Stafford, to bring schools and businesses together to help our students cultivate the skills needed in today's workforce. 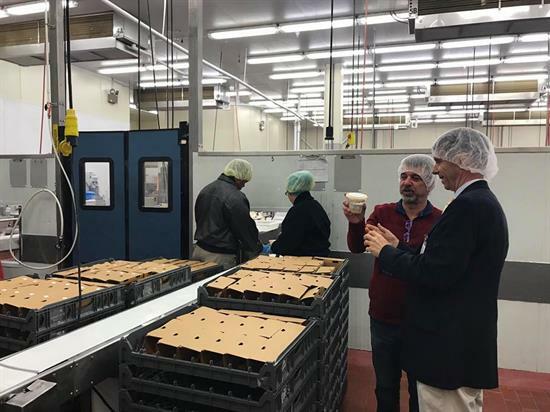 I stopped by Greencore's operations here in Virignia to hear how regulatory relief has impacted their business. 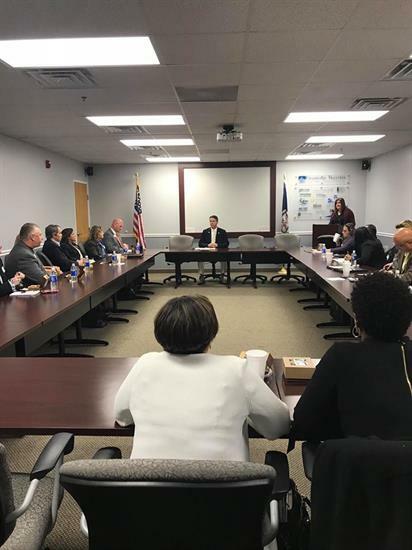 I met with government contractors in Prince William County to discuss how I fought for Virginia priorities in this year's National Defense Authorization Act. 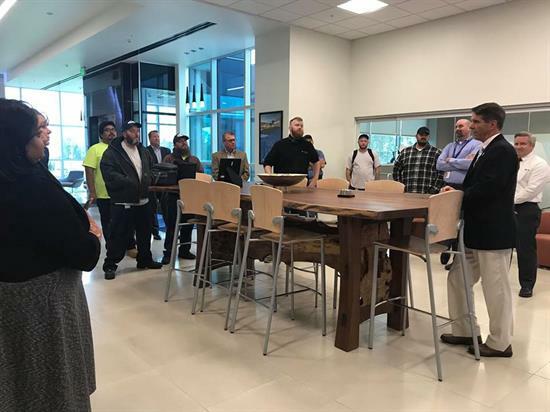 I stopped by Iron Mountain Data Center In Manassas to catch up with employees after attending their grand opening last year. 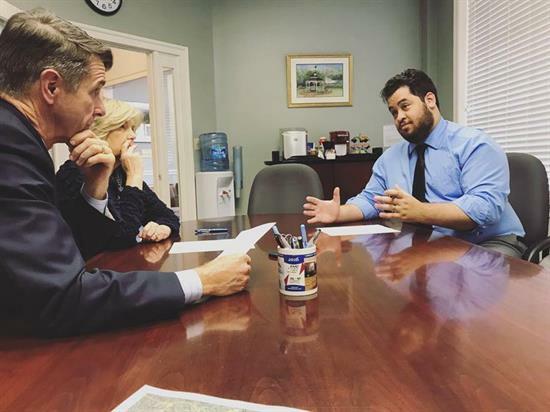 I met with Supervisor Anderson to visit Old Bridge Road and discuss congestion solutions. 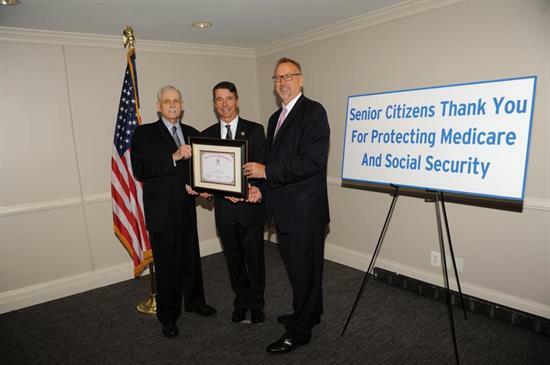 I received the Guardian of Seniors Right's Award from the 60+ Association for my commitment to protecting Social Security and Medicare for current beneficiaries. 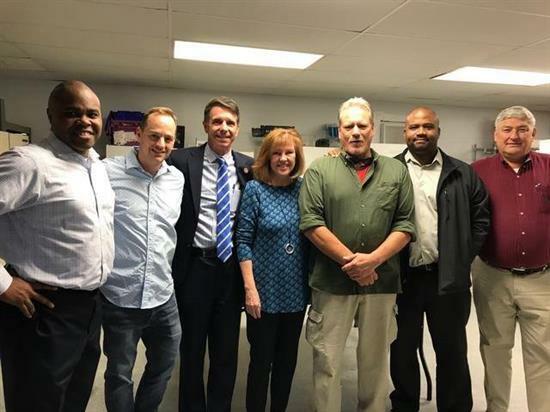 I visited StreetLight Ministries in Prince William County to drop off some donations and talk with their team about the ways they serve the homeless in Northern Virginia. I really enjoyed getting out in the community to interact with constituents regarding the issues most important to you. Please do not hesitate to contact me so I can best represent you.